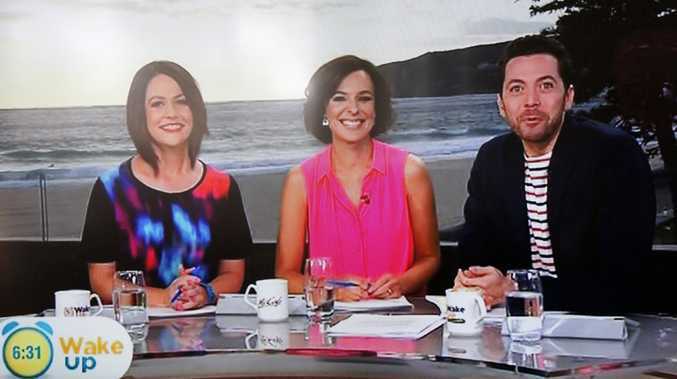 Hosts Natasha Exelby, Natarsha Belling and James Mathison's Wake Up debut. CHANNEL Ten's bid for a bigger share of the breakfast TV audience is off and running. 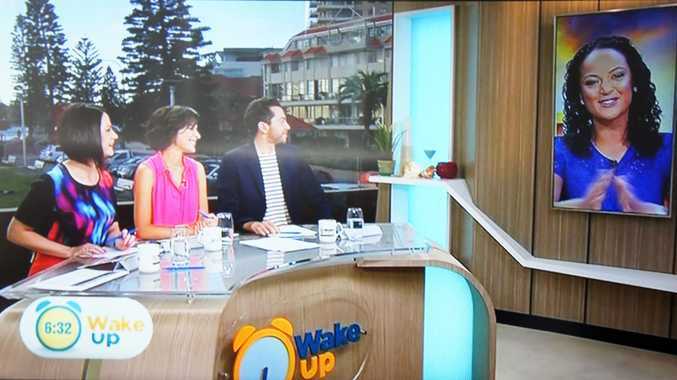 Wake Up got off to a good start when it debuted earlier this morning. Co-host Natharsha Belling revealed a family member's dream that she would have a major stuff-up and have to go to an ad break, but luckily the premonition didn't become a reality. Belling, James Mathison and Natasha Exelby introduced the show from the deck of the Queenscliff Surf Life Saving Club at Manly Beach before launching into the local news headlines presented by Nuala Hafner from Melbourne. The Wake Up hosts speak with news presenter Nuala Hafner. The first issue current affairs issue, or "talking point", the trio discussed with Fairfax journalist Jo Casamento was Clive Palmer winning the Sunshine Coast seat of Fairfax and whether or not he is "good or bad" for Australian politics. The hosts look relaxed, despite Exelby admitting to being nervous. Exelby was the first to christen the show's blooper reel, introducing the show's Million Dollar Nipper promotion as a partnership with the Queensland Nippers, rather than the Queenscliff Nippers. "I'm from Queensland, it's going to happen from time to time," she laughed. "I'm glad it happened on the first day." Helping to launch the show's "housewarming week" will be Perth rockers Eskimo Joe, who are slated to perform in the "beach house" later this morning. The show is also promising interviews with heaps of film stars this week, including Harrison Ford, Natalie Portman and Chris Hemsworth. It's certainly a more impressive start than Ten's ill-fated Breakfast program last year. But does the show offer something different enough to attract viewers? I think the hosts have good chemistry but they will take a little while to bed in. Tomorrow's ratings results will be the first litmus test.